In a city facing economic depression, a trash crisis, and mafia threats, WorldVenture missionary Tim Faulkner wants to help by transforming lives first and foremost. In the last 17 years, Tim Faulkner can count the number of Catholics he’s met in Naples who have a relationship with Jesus. Sure, they’ve been baptized Catholic, and they’ll maybe even admit they’re sinners in need of grace. But they also have these folk sayings, sayings like “I’m not an animal, so I must be a Christian.” They don’t read their Bibles and don’t know what they believe. As a leader at Il Faro International Baptist Church, Tim knows how difficult it is for Neapolitans to reject part of their identities as southern Italians. Fear of family tension often holds them back. Tim has been a part of a team of people working to build up Italian leaders for the church that has passed on leadership to Italians three times. Suspicion of authority runs rampant in Naples, impacting everything from church leadership to friendships, even to the point that people refuse to deviate from their go-to pizzeria. The mafia holds significant control in the city, affecting the practical day-to-day lives of Neapolitans. I sat down with Tim to grasp what it’s like to be a missionary in Naples, a complex city of economic depression, nominal Catholicism, and mafia corruption. Many people have the perception that Italy is a romantic paradise where they can eat pasta and look at beautiful art. What’s the reality of living in Naples? Rick Steves calls Naples a living ancient city. If you walk through the streets of Naples, you’re gonna hear people yelling out to sell their fish and their wares. You’re gonna see laundry hanging off the balconies. And so you’ve got this coming together of the modern and the very old idea of Europe. It’s a port city, so it’s been overrun by all kinds of people, which has made its people very skeptical of leaders. It’s a city that has some very significant problems, including the trash crisis. The mafia makes a lot of money in the trash business, so if you don’t have places to take it and the workers aren’t being paid, it becomes a major mess. You have the reality of the mafia: there’s a lot of drugs, infighting in the families, and a couple years ago we had a homicide a day. That’s the kind of atmosphere that Neapolitans live in. We have that romantic idea of Italy, but the reality for most Italians in the south is that we live in an area where job opportunities are scarce. There’s a lot of despair, and as a result, there’s more openness to the gospel than in the north. Some of the largest evangelical churches are in the south. What does it mean for you as a church leader to serve a culture that’s been betrayed so often by authority? This is the first church I’ve been in where we post our elder meetings for everybody to read. We have to be very transparent about all of the finances and decisions. There is no pastor appreciation month; it’s consistent criticism and questioning all the time. It makes it really hard and it can be very discouraging. You feel like the Lord knows how hard we work and how hard we try not to favor anyone over others. Do you have an example of someone you helped to know Christ? I go running twice a week with Enzo, a guy I brought to the Lord. I started going into his deli in the afternoons and waiting for moments to engage him in conversation. That was about a nine-month process, and then at one point, he started reading the gospel of John. That’s when he realized he needed to make a decision to become a disciple of Christ. Before he came to Christ, he and his wife fought like cats and dogs, but after, his family was amazed at the transformation in their marriage. It took his wife another year to come to church, but the changes in Enzo’s life convinced her of Jesus. One of the neat things about this is Enzo never went to high school, and yet he’s now taking college Bible courses, so it’s very encouraging to see that process of growth. He’s my running partner and we’re able to be very honest with our struggles with each other, and it’s a great accountability relationship. According to tradition, Peter and Paul came to preach in Naples. Does thinking about the city’s significant early church history change the way you do ministry? I think it gives us a deep burden for Europe. Europe is a challenging place to get people to believe that we need missions. It’s not a very responsive continent, but Christianity was here, and the church was here, and it grew and expanded here, and now it’s not important anymore. You see all the trappings of Christianity, but you don’t see Christ in people’s lives. And I think that’s what makes it hard. You have to share the gospel 100 times to see one person come to Christ. How has your church reached out to people living in the margins in Naples? A few months ago, the ministry in our church for human trafficking was able to take the third lady off the street this year and get her to a safe house, and this was a lady with a son. She’ll be trained in some kind of job and they will do their best to integrate her into society. With the depressed economic situation of Naples, are there any ways in which you’re hoping to help Neapolitans in tangible ways, such as business as mission? I think that’s definitely where we need to go. As WorldVenture in Italy, our goal is to plant churches and train leaders, but then we’ve got to find ways to support those leaders financially. We’ve talked about the need for job creation. I think there’s definitely a need for business as mission and that would be a way we could encourage our young people. One of the struggles we have in Naples is people come to Christ and then they leave to go find jobs elsewhere. If you were trying to recruit more missionaries to Naples, what would you say is the biggest need? There are the popular things that we could say. There’s anti-human trafficking; Italy is one of the huge places in Europe where they bring prostitutes. Refugees are pouring into Sicily all the time on boats coming over from Africa, and they’re funneling out to the rest of Europe. These are needed ministries, but we can’t take our attention off of the need to develop new local churches. When you put a church full of people with transformed lives in a community, you have a chance to impact society. And if we don’t continue to do that, then all of these other good ministries are not going to be supported and sustained long-term. So I would say there are different things people could do: business as mission, human trafficking, refugee ministries, but we want to continue to recruit people to start churches, train leaders, and support those leaders. 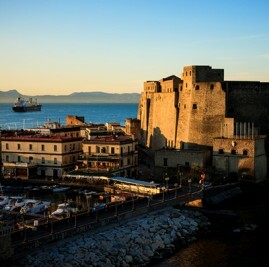 What has given you the most joy from serving in Naples? On a personal level I see how much growth has taken place in my life. In the book of Jonah, God wasn’t just reaching the Ninevites; He was reaching His own prophet. I think in order to make us more effective, God has to change our hearts. I grew up in a little farming community in New York, and now I’m in a city of four million, I speak another language, and I have all these relationships. This is incredible! You pinch yourself sometimes; I can’t believe that I live here and I do these things. Even though it’s hard, just the fact that I can be there, and I’m in Italians’ homes and hearing their stories, and their arguments, it’s a special privilege that God gives me. WorldVenture has written about opportunities to serve with Journey Corps in Naples, helping Tim and others to transform Naples.